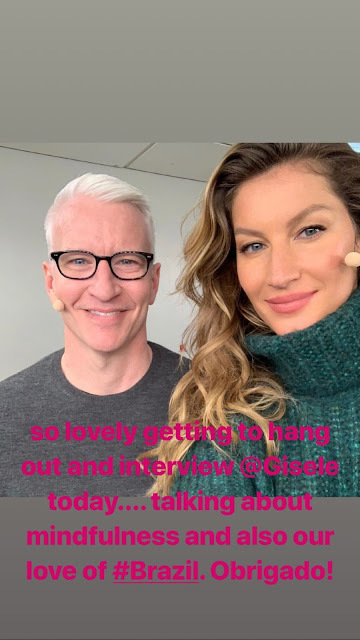 Anderson Cooper co-anchored CNN Newsroom with Brooke Baldwin in the 2pm and 3pmET hours from Pittsburgh, PA.
Anderson Cooper was back in the 8pmET hour to anchor AC360 from Pittsburgh, PA.
Anderson Cooper co-anchored CNN Newsroom with Brooke Baldwin in the 2pm and 3pm ET hours. 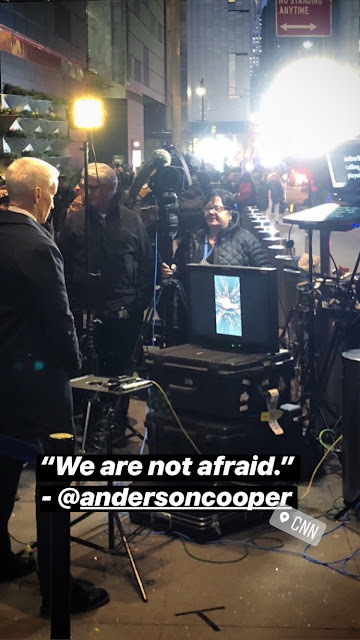 Anderson anchored from Pittsburgh, PA.
Anderson was back in the 8pmET hour to anchor AC360. 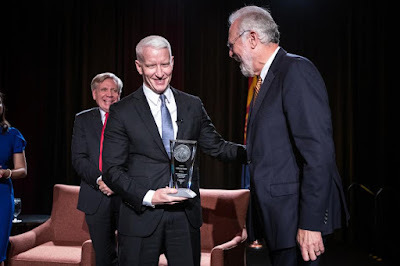 Anderson Cooper received the Cronkite Award for Excellence in Journalism on Wednesday, October 17th, in Phoenix, Arizona. Cooper, who anchors “Anderson Cooper 360” on CNN and is a correspondent for “60 Minutes,” received the award for his commitment to journalism throughout his lifetime. In addition to this recognition, Cooper has received five Emmy Awards and a Peabody Award for his coverage of Hurricane Katrina. Cooper, 51, is the second youngest person to receive the award, with Brian Williams and George Will being tied for the youngest at 50. Williams received the award in 2009, and Will received the award in 1991. Christopher Callahan, dean of the Cronkite school, said there is no one more deserving of the award than Cooper. "I can think of no more fitting recipient of the Cronkite award in 2018 than Anderson Cooper of CNN," he said. "Thank you for everything you do every day, speaking truth and power in the great tradition of Walter Cronkite." Cooper, on the other hand, said he did not think he was deserving of the award, adding that he initially declined the honor until he found out no person has ever said no. However, one award has been rescinded by the school. "I still feel like there's a lot I need to learn and can learn and a lot I can get better at," he said. "More often than not, I see moments that I missed or questions that I didn't think to ask in the moment. I see words that I failed to write or sentences that I failed to think of." Although he has enjoyed every moment as a correspondent, Cooper said that he is rarely satisfied with his work. Cooper attributed all the people behind the scenes who help him as another reason why he did not feel like he deserved the award and said there should be as much recognition for the producers, cameramen and everyone who helps produce his show. In addition, Cooper went on to talk about the stigma surrounding journalism right now. Kevin Hurley Anderson Cooper speaks at the Walter Cronkite School of Journalism and Mass Communication after accepting an award for Excellence in Journalism Luncheon at the Sheraton Grand Hotel in Phoenix, Arizona on Wednesday, Oct. 17, 2018. "Leaders manipulate divisions, attack the press; lies are called truth, truth is called a lie, societies divide among ethnic, religious and political ties and chaos ensues," he said. "I'm speaking about what I've seen overseas but also about what can happen here." Cooper said that there are many things the media can improve on, but journalism should not be seen as an enemy. "This I know, I know that the kids who are studying here, young journalists, are not the enemies of the people," he said. Last year, when Judy Woodruff, anchor and managing editor of "PBS NewsHour," received the award, she also spoke about the political climate surrounding journalism. "I am not an enemy of the American people," Woodruff said at last year's luncheon. "I love this country, and I always will, and almost every journalist I know feels the same way." Connor Morman, a freshman studying sports journalism, said that it was great to be surrounded by the Cronkite community at the luncheon. Morman said he looks up to Cooper, and that it is inspiring to see so many people in support of journalism. "It's nice, I think it's good when everyone is supporting journalism," he said. "It's something important in the world. We need people out there getting the facts and news out there to inform the people." Following the luncheon, Cooper held a Q&A in the Cronkite building's First Amendment Forum for students, where he reiterated many of the points he gave in his acceptance speech earlier that day and answered questions from the audience. When asked about the current state of journalism in the U.S., Cooper said journalists must focus on their work. 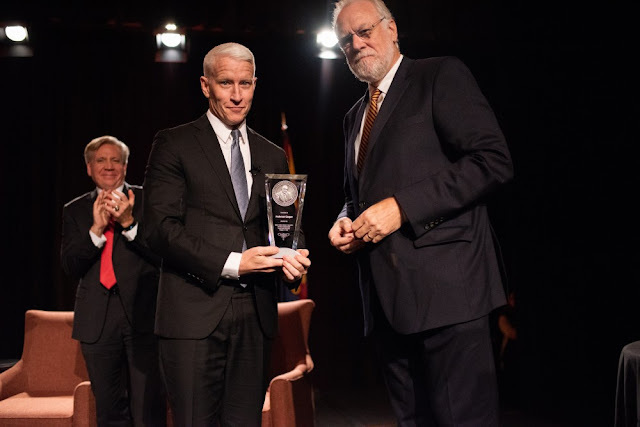 The annual award, presented every year since 1984, is given by the Walter Cronkite School of Journalism and Mass Communication and the Cronkite Endowment Board of Trustees at ASU. 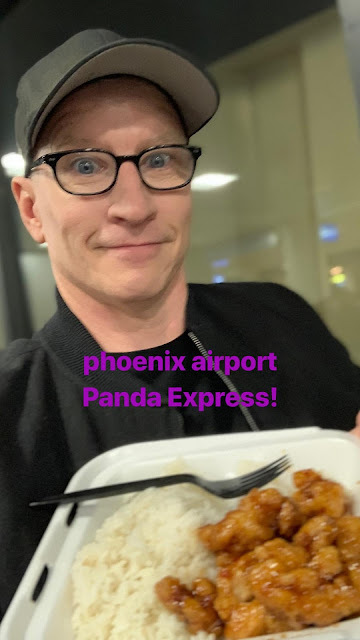 “It’s really an incredible honor to be here and it’s quite intimidating to know the incredible roster of journalists that have been here before me,” Cooper said, addressing more than 1,200 people at the Sheraton Grand Phoenix hotel in downtown Phoenix. The audience included many media professional and student journalists, faculty and representatives from a variety of Valley businesses. Cooper’s speech underscored the role of journalism in a political climate that has questioned the media's integrity. "Truth ... is under assault, facts are called fake, lies are used to divide us to weaken confidence in journalism and the core institutions that are essential to maintaining our democracy,'' Cooper said. A short video that traced Cooper’s 18-year reporting career was shown at the event, showing him reporting from some of the more dangerous regions of the world. 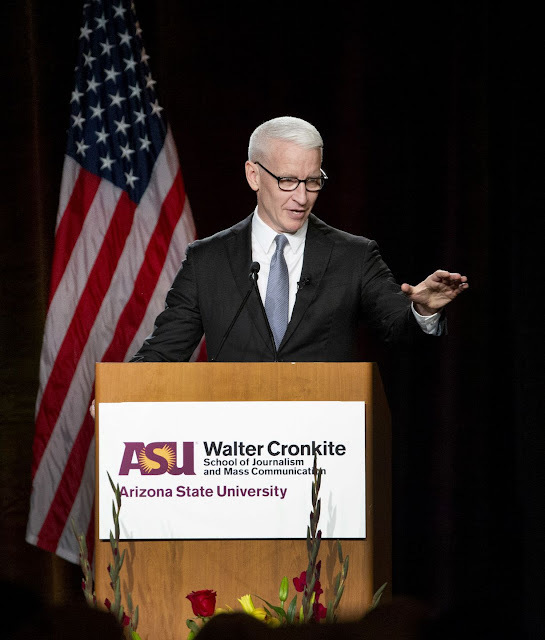 Cooper then took the stage and highlighted one of his memorable encounters with Walter Cronkite, the legendary CBS anchor and namesake of the award and school, who faithfully attended the annual ASU event before his death in 2009. “I did an interview with him … in Los Angeles,” he said, adding it was in front of a large crowd when Cronkite’s hearing was significantly impaired. “I asked him the second question and he looks at me… he says, ‘My ear system isn’t working.’ … it ended up with me screaming at Walter Cronkite,” Cooper said, prompting laughs from the audience. The Cronkite Award will join Cooper’s cabinet of 13 Emmy awards, a Peabody Award and an Edward R. Murrow Award. 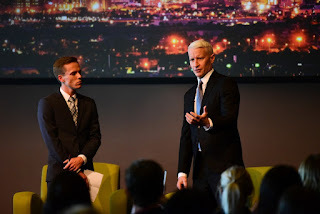 The Emmy winner accepts his 2018 Walter Cronkite Award for Excellence in Journalism and speaks of the continuing importance of the field CNN reporter Anderson Cooper has covered some of the worst humanitarian crises in the world, yet he remains an optimist about mankind and, especially, the role of journalists in telling people's stories — despite current antagonism toward the media. “The answer to the attacks on reporting is more reporting,” he said. 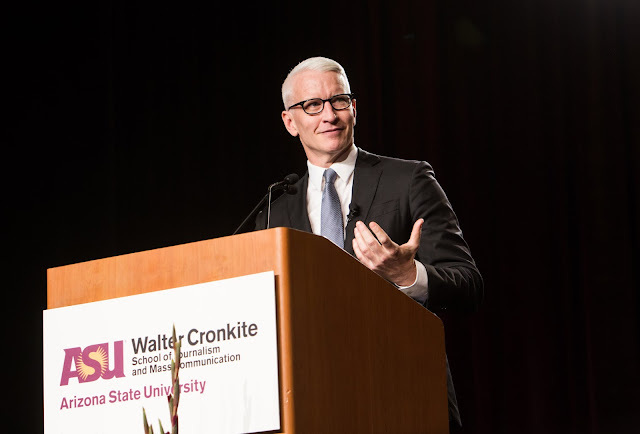 Global poverty is declining and literacy and health are improving, and there is much to be hopeful about, Cooper said at the awards luncheon held by the Walter Cronkite School of Journalism and Mass Communication at Arizona State University. “The thing that gives me the most hope is the power each of us has to reach out and care for someone else,” he said. Cooper, who has covered war zones and natural disasters, recalled the many times he has seen strangers helping each other during a crisis. “I’ve seen so many acts of bravery and selflessness among others,” he said. 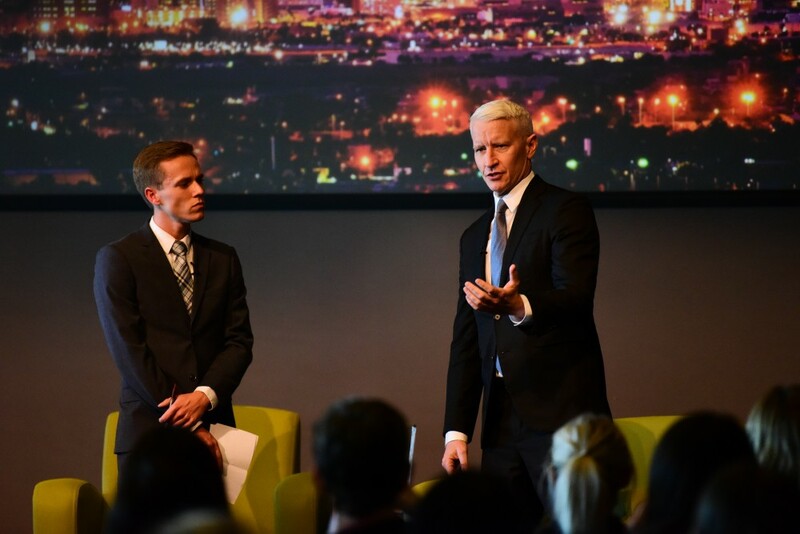 Cooper praised the Cronkite School students and said he’s impressed that they have a clear vision of their journalism careers. After he graduated from college, he wasn’t sure what he wanted to do. He tried to get a job as a broadcast journalist, but when no one would hire him, he set off for Africa. Using a fake press pass, he went to Somalia in 1992, during a famine and civil war. “Until I had been to Somalia, I had never seen starvation up close,” he said, remembering the bodies piled up everywhere. He sat with a couple whose young son had just died, the boy’s legs as thin as the twigs that made up their hut. He was their fourth child to die. Even with all the powerful stories he has told, Cooper still feels like he rarely does justice to the enormity of the moments he has seen. “You try to capture all that — not just the facts and numbers and names but the sounds and the smells and the silences. “You try to find words to convey the horror and humanity you’re surrounded by. Christopher Callahan, the dean of the Cronkite School, thanked Cooper for “speaking truth to power in the great tradition of Walter Cronkite.” “At a time in our history when journalism, facts and the truth itself are under attack every day, we believe that a free, robust and unfettered press remains the most essential element to the health and the future of our great country, our democracy and our freedom,” Callahan said. Gabriella Bachara, a senior in the Cronkite School, told the crowd that Cooper is a constant presence on the big TV screen in the First Amendment Forum in the school. “I’ve sat in the forum with hundreds of other students watching him break the biggest news stories during my four years here at ASU,” she said. 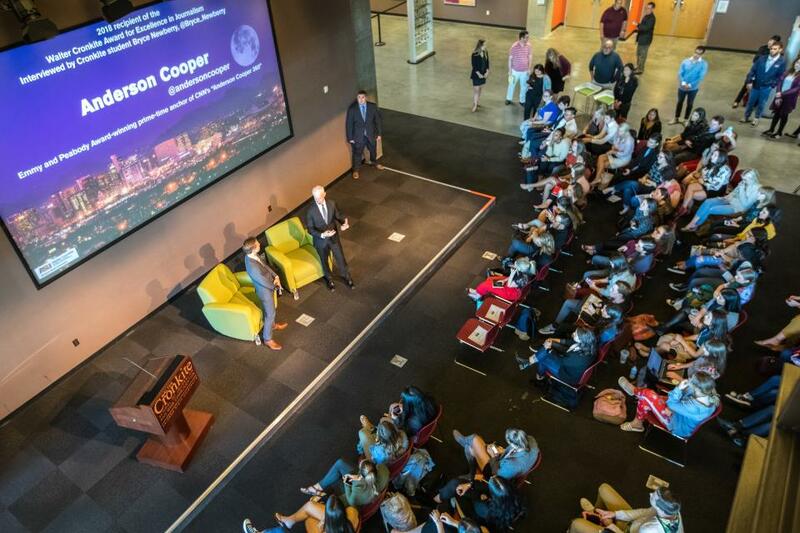 After the luncheon, Cooper met with students in the Cronkite School on ASU's Downtown Phoenix campus. Senior journalism major Bryce Newberry asked Cooper how he prepares a show when the news is constantly changing. “All I do is read stuff all day long,” Cooper said. Now That preparation allows him to see their talking points. Cooper told the students that they have technical skills he never learned, but that passion will be the key to their careers.